For any questions or to book a trip, please feel free to contact us via phone or email. From May through November, we are on the water almost every day, and will get back to you as quickly as we can. Trip times are tailored to each customer’s preferences, but generally, we get off of the water at about 4pm, and so phone calls and emails will be returned in the late afternoon and evenings. Thank you. To mail a deposit or other materials to us, please send it to our Traverse City Bass Guide Service office at 4819 Arbutus Lane, Beulah, MI 49617. Or, please call or email for other arrangements. Traverse City Bass Guide Service offers full and half-day trips for one or two anglers. A third angler can easily be accommodated for an additional fee. We work with other Sport Fish Michigan Captains to accommodate larger parties of four anglers or more. 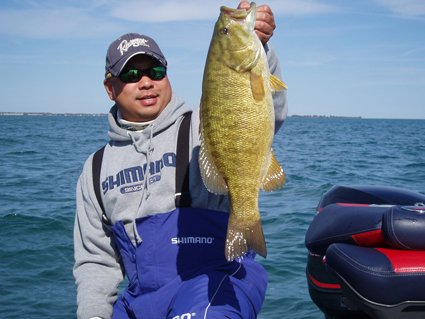 Whether you have just a few hours to fish, or if you have all day, we would love the opportunity to show you this incredible smallmouth fishery. Despite rising fuel costs, we keep our rates as competitive as possible. Please contact Captain Ben for our current rates either via phone or email. We would be happy to discuss our pricing with you, including possible discounts for multiple bookings. A $100 deposit is required to secure your trip date of choice. In the event that Mother Nature steps in, as your Captain, we will make the call if the weather is unsafe in which to fish. It’s always better to reschedule than to regret being caught out on the water in dangerous weather. I reserve the right to retain your deposit should you cancel within 14 days of your trip without rescheduling, or are a no-show at the boat ramp on the day of your trip. We understand that things do happen, and should something arise, please call and we can discuss your options.